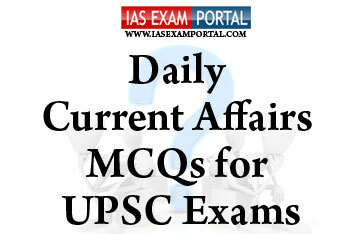 Current Affairs MCQ for UPSC Exams - 12 April 2019 | IAS EXAM PORTAL - India's Largest Community for UPSC Exam Aspirants. 1) The GFSR provides an assessment of balance sheet vulnerabilities across financial and non-financial sectors in advanced and emerging market economies. 2) As per the report there continues to be a high stock of non-performing assets (NPAs) in India, and there has been some progression. 3) According to the report China is likely to become more important for other emerging markets as it gets included in benchmark indices. Portfolio flows to China are expected to increase by $150 billion by 2020 due to its inclusion in a global bond index. Q3. Which of the following statements regarding E-cigarettes are true ? 1) Vaporizers and e-cigarettes are a way for current smokers to smoke in a safer way for themselves and those around them. 2) Unknowing users can be exposed to unsafe levels of nicotine and benzoic acid, which results in sore throat, coughs, nausea and abdominal pain by the use of e-cigarettes. 3) Halting imports of e-cigarettes into India will be against multilateral commitments with the World Trade Organization. Q4. Which of the following statements regarding the money bill under article 110 are true ? 1) The Constitution has empowered the speaker of LokSabha to decide if the bill is a money bill. And his decision in this regard is final and cannot be questioned. 2) In British Parliament the speaker’s decision on certification of money bill is subjected to judicial review. 3) The idea behind a money bill in India is derived from Irish constitution. Q5. The country is a landlocked country in southeast Africa that was formerly known as Nyasaland. It is bordered by Zambia to the northwest, Tanzania to the northeast, and Mozambique on the east, south and west. It was recently in news as cyclone ‘Idai’ had caused large scale destruction in the country. The above description refers to which of the following countries ?